From the final days of TYCO HO-Scale Electric Trains comes the above picture of Dad and Grandpa having some fun with Junior's Christmas present. Don't play too much with it gentlemen, it'll likely be in pieces and not working by the time the Christmas dinner leftovers are gone! This picture is found in TYCO's 1992 product catalog. 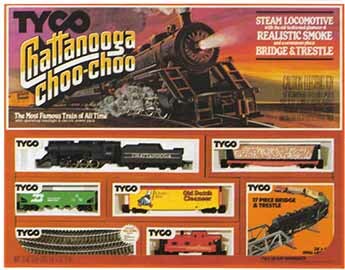 A popular and well-remembered entry in TYCO offerings is the Chattanooga Choo-Choo product line. It is first found in the company's 1975-76 catalog. 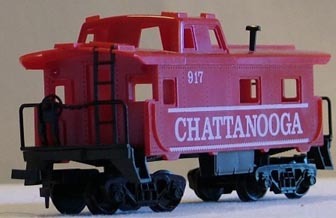 TYCO designated Chattanooga dressed pieces with a -15 suffix on the stock number and both the steam engine and caboose are listed as separately available items, in addition to the train set beginning in 1975. Introduced in the 1975-76 line, the 2-8-0 Consolidation was the first loco dressed in Chattanooga dress. 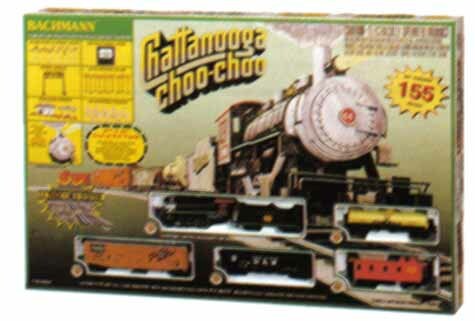 The original set was called The Chattanooga Choo-Choo With Smoke & Steam Whistle (No.7331) and appears in TYCO's 1975-76 and again in the 1976 catalog. This first TYCO Chattanooga set in addition to the 2-8-0 Consolidation loco also came with a Santa Fe Crane Car and Boom Tender (No.932); Old Dutch Cleanser Center-Flow Hopper (No.358F); Gulf Triple Dome Tank Car (No.357B); Chattanooga Wide-Vision Caboose (No.327-15). The set also included (No.934) Remote Control Steam Whistle in Billboad featuring Maxwell House Coffee card inserts for its billboard. Finishing out this popular set was a 36" x 45" oval of track that could be set up with a raised section thanks to the inclusion of a 17-piece Bridge & Trestle Set (No.907) and the standard 1-amp TYCO-PAK (No.899). TYCO's 50th Anniversary catalog of 1976 includes the very same set and carries the same stock number. TYCO lists the Chattanooga 2-8-0 Consolidation Steam Engine and Tender with Smoke as also availabe separately from the train set offering beginning in the 1975-76 product catalog. Bought by itself, the Chattanooga Consolidation & Tender 2-8-0 (No.245-15) retailed for $33.00 in 1975. According to the 1975-76 catalog you could also obtain a Chattanooga Caboose (No.327-15) as a separate item. 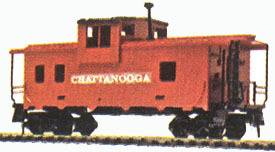 This original Chattanooga Caboose is shown as being TYCO's wide-vision cupola body style. Above is the originally pictured Chattanooga wide-vision cupola Caboose. It's decoration differs from regular production run examples and it is thought to merely be a mock-up or prototype produced for the catalog in 1975-76. Here's what is really out there, TYCO's production run example of the first Chattanooga Caboose (No.327-15) found in 1976. By 1977, the wide-vision body was dropped in catalogs in favor of TYCO's streamline cupola model. For 1977, TYCO's Chattanooga line added diesel power in the form of a yellow-and-orange GP-20 heading up The Chattanooga Choo-Choo with the old fashioned sound of the steam whistle (No.7323) train set. The catalog boasts, "America's favorite train. The Chattanooga Choo-Choo at a new lower price that almost everyone can afford." This 1977 set featured in addition to the Chattanooga GP-20 a Wesson Tank Car (No.315K); Baby Ruth Billboard Reefer (No.355C); Old Dutch Cleanser Center-Flow Hopper (No.358F); Jell-o Billboard Box Car (No.365A) and a yellow-and-orange streamline cupola Chattanooga Caboose (No. 327-15B). 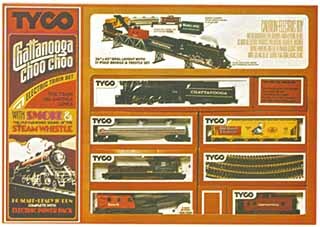 Extras in the GP-20 Chattanooga set included TYCO's Remote Control Steam Whistle in Billboard (No.934); 36" x 45" oval of track; and naturally a 1-amp TYCO-PAK (No.899). The 1977 catalog description includes the "As advertised on TV" logo, so a TV commercial may also be out there for this set. TYCO does list a steam powered Chattanooga dressed train set in 1977, The Mammoth of the Rails with Smoke & Steam Whistle (No.7337) headed up by a Chattanooga 2-8-0. This train set offering had many extras and was one of the most well-appointed in the line. The Mammoth kicks off with the Chattanooga Consolidation & Tender with Smoke (No.245-15); Virginian Hopper (No.344C); Santa Fe Crane Car with Boom Tender Set (No.932); Morton Salt Center-Flow Hopper (No.358B); Ralston Purina Billboard Reefer (No.355E) and a red steamline cupola Chattanooga Caboose (No.327-15). The Mammoth also included a Remote Control Steam Whistle in Billboard (No.934); Operating Crossing Gate (No.908); Santa Fe Piggyback Flat Car Set (No.348); Burlington Unloading Box Car (No.930); a 45" x 63" double-oval track plan with a pair of electric Remote Control Switches (No.910-7 and No.911-7) and a 1-amp TYCO-PAK (No.899) that would certainly get a workout from all the accessories in this set. TYCO's 1977 mighty SYSTEM 200 (No.7340) super set also had Chattanooga representation. The Chattanooga GP-20 (No.228-15)joins the Chessie System F-9A among the contents of this major set. 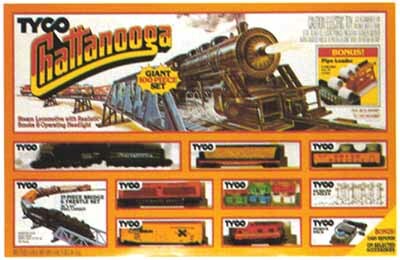 For those desiring adding some Chattanooga pieces to their pikes without going the train set route, TYCO did offer a number of separate Chattanooga items in 1977. You could buy either the Consolidation & Tender 2-8-0 with Smoke (No.245-15) or the new-that-year Chattanooga GP-20 (No.228-15). The 2-8-0 retails for $36 in 1977 and the GP-20 went for $16. The Chattanooga caboose offerings change and expand in '77. Gone is the wide-vision cupola body style, replaced by a pair of offerings both featuring TYCO's steamline cupola body. The catalog lists a red Chattanooga Caboose (No.327-15) and a yellow-and-orange to match the GP-20's paint Chattanooga Caboose (No.327-15B). Both sold for $2.50 retail in 1977. The solid red example carries the roadnumber 607 and includes a white stripe. The yellow-and-orange model is unencumbered with a roadnumber and features TYCO's Chattanooga stylized logo in white on its side. Joining the roster in 1977 were two new examples of the TYCO Chattanooga caboose, both featuring the streamline cupola body. Above is the solid-red Chattanooga Caboose (No.327-15) and below is the yellow-and-orange Chattanooga Caboose (No.327-15B). The added "B" to the second model's stock number suffix of "-15" is a rare time that TYCO's number system ran over its banks and needed some thing extra. The "327" represents the caboose and the "-15" denotes Chattanooga paint, but that is all the regular system is equipped to describe. Adding a letter, in this case a "B" to the "-15" means it is the second offering of the same caboose and same roadname for that item. Another example of this are the letters added to the suffix numbers on the various TYCO Pennsy GG1s. TYCO for 1978 makes further changes to the Chattanooga train set offerings. First, the GP-20 powered set no longer carries the name Chattanooga becoming The Southern Express (No.7310). The set is very similar to 1977's GP-20 Chattanooga example, but the Steam Whistle Billboard is dropped and a 17-piece Bridge & Trestle Set (No.907) is added. TYCO doesn't even bother to describe the GP-20 as Chattanooga, but refers to it in the catalog description as "A modern GP-20 Southern Loco." Replacing the Consolidation 2-8-0 steamer is the Chattanooga 0-8-0 Steam Loco & Tender (No.256-15) first seen in 1978. Sound is new for the steam powered Chattanooga train set in 1978, but nobody at Broadway Limited Imports, Tower 55, or Atlas would lose much sleep over the high-tech method employed by TYCO to make the train make noise. The Chattanooga Choo-Choo with Smoke, Chug-Chug & Steam Whistle (No.7332) for '78 is the first to include TYCO's Chug-Chug Sound in Box Car (No.902). This accessory was the typical TYCO 40' Hi-Cube Box Car altered to include a large roller that was placed inside the shell and made contact with the track. In crude terms, it is literally "a box of rocks," as the roller contains small materials that bounce along and make a "chug-chug"-ish sound with the train. Again very crude in design, but it did pretty much do what it was promised to do and was a reliable accessory to boot. Also offered as a separate item is TYCO's Action Cars & Accessories line is this Baby Ruth decorated Chug-Chug Sound in Box Car (No.902) first offered in 1978 and included in the steam powered Chattanooga train set. Extras for this train set included the already mentioned Chug-Chug Sound in Box Car (No.902), plus the Remote Control Steam Whistle in Billboard (No.934) and a 17-piece Bridge & Trestle Set (No.907). It should also be noted that 1978 is the year TYCO introduces Tru-Steel Track. This new steel rail track replaced the long-supplied brass section track and was likely included in train sets beginning in '78. Additionally, the "As advertised on TV" logo is included in the 1978 TYCO catalog, therefore a TV commerical most likely exists for this train set. TYCO also includes Chattanooga decorated locos in both The Mammoth of the Rails (No.7337) and the big System 200 (No.7340). Though both sets appear similar and carry identical stock numbers from 1977 to 1978, the Mammoth's steam engine switches over to the 0-8-0 model from the previous 2-8-0 offering. Separately, you could find the newly introduced Chattanooga 0-8-0 Steam Loco & Tender with Smoke (No.256-15) cataloged in 1978, as was the Chattanooga GP-20 (No.228-15). Both versions of the Chattanooga Caboose models remain in the catalog for '78 (No.327-15 and No.327-15B). From the late-1970s into the mid-1980s, TYCO's Chattanooga offerings at first stay the course without change and later all but disappear. For 1979, TYCO catalog's The Chattanooga Choo-Choo with Smoke, Chug-Chug & Steam Whistle (No.7332) matches the 1978 set in name, stock number and contents. The only minor changes appear to occur with the selection of rolling stock inclusions in some sets over this period. The same applies to The Mammoth of the Rails (No.7336), also powered by the 0-8-0 Steam Loco & Tender. TYCO does display the Mammoth in '79 with a Union Pacific Gondola with Culvert Pipe (No.341B); a Burlington Norhern Hopper (No.344G); a Great Norther Skid Flat Car with Culvert Pipe (No.342D) and the black-door RailBox Billboard Box Car (No.365F). TYCO's System 200 (No.7340) featuring the Chattanooga GP-20 appears the same from '78 to '79. Separate 1979 cataloged Chattanooga pieces see the GP-20 no longer listed and the yellow-and-orange Chattanooga Caboose (No.327-15B) is also absent, though the Chattanooga Steam Loco & Tender 0-8-0 (No.256-15) and the solid red Chattanooga Caboose (No.327-15) survive. 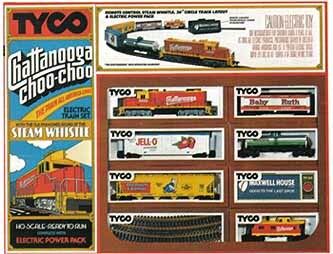 TYCO gives The Chattanooga Choo-Choo (No.7332) a big two-page spread in the 1980 catalog. The set contents and stock number remain unchanged in 1980 from its 1978 example. The Mammoth of the Rails (No.7336) for '80 is identical to the revisied 1979 example. 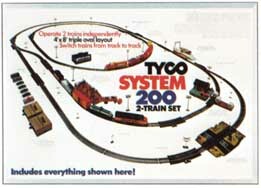 TYCO's System 200 set is gone in 1980 and with it goes completely the Chattanooga GP-20 from the catalog. Separate purchases of the Chattanooga 0-8-0 Steam Loco & Tender (No.256-15) and the Chattanooga Caboose (No.327-15) remained possible according to the 1980 catalog. Though it appears to be similar in contents, 1981's The Chattanooga Choo-Choo (No.7318) differs in the lack of extras. TYCO now only includes the 17-piece Bridge & Trestle Set (No.907). The boasts of hearing steam whistles and chug-chug sound of year's past is replaced in the 1981 catalog by, "the old-fashinoed glamour of Realistic Smoke." Who knew smoke was glamourous? The set's rolling stock included the Southern Pulpwood Flat Car (No.344A); Burlington Northern Hopper (No.344G); Old Dutch Cleanser Billboard Box Car (No.365G) and Chattanooga Caboose (No.327-15). The '81 catalog does include the "as advertised on TV" logo. 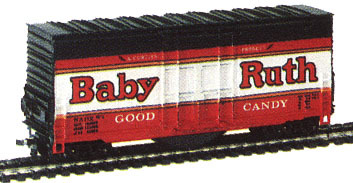 To provide some insight into to putting too much importance upon catalog listings versus actual availability, it should be noted that the Southern Pulpwood Flat Car had been out of the catalog as a separate rolling stock item since its last pictured appearance in the 1978 TYCO yearbook. TYCO was very good about producing items that never made into catalogs and many items due to large production quantity and possibly luke-warm sales remained on shelves for years after they departed catalogs. TYCO's 1982, 1983 and 1984 catalogs do not include any train sets with Chattanooga locos. Only the Chattanooga 0-8-0 Steam Loco & Tender with Smoke (No.256-15) reamins to represent the line for these three years. Guess that glamourous smoke, just didn't bring enough interest? After a three-year absence, TYCO introduces The Chattanooga (No.7416) to the train sets of 1985 catalog. The contents of the train set package displayed in the catalog for '85 differ from what TYCO shows rounding a curve next to the set box. Again, the set is powered by the Chattanooga 0-8-0 Steam Loco & Tender (No.256-15) and the catalog shows it pulling a blue Conrail Hopper (No.344H); a solid yellow Railbox Billboard Box Car (No.365F); the Southern Pulpwood Flat Car (No.334A) and the General Purpose Caboose (No.327-98). By this point, TYCO only lists the Conrail Hopper as a separate item in the Freight Cars section. Though as pointed out, the catalog is likley not all-inclusive and these other pieces of rolling stock were probably quite available at the time. In contrast, TYCO's package displayed next to the image of the train shows an Old Dutch Cleanser Billboard Box Car; a BN Hopper; and most curiously a Santa Fe streamlined cupola Caboose. Rounding out the contents listed for this set in '85 is the 17-piece Bridge & Trestle Set (No.907); a 36" x 45" oval of track and a TYCO-PAK (No.895). The standard issue 1-amp TYCO-PAK had been modernized to the black unit with blue throttle during the absence of a Chattanooga train set in the TYCO product line. The last time TYCO offered a Chattanooga set in 1981, the gold TYCO-PAK (No.899) was the current offering. The 1985 TYCO catalog lists as NEW, a Chattanooga 0-8-0 Steam Loco & Tender with Smoke (No.256B-15). Though the loco had no seen any changes, the "B" addition represents TYCO's offer of a free Remote Control Switch (either No.410 or No.411) to be included with numerous locomotives beginning in 1985. Sharing the page with TYCO's Rambo Electric Train and Battle Set in 1986 is a new 100-piece The Chattanooga (No.7423). Still powered by the 0-8-0 Steam Loco & Tender, this 1986 set included TYCO's 1980s introduced non-electric Operating Pipe Loader with Pipe (No.958), plus the Autoloader with Six Autos (No.349). The Autoloader's automobiles were going through changes at this time and TYCO shows the train set including the very simply single-color one-piece body general compact vehicles. These simplier autos replaced TYCO's famous late '60s Chevy Camaro and AMC Javelin models. The 1986 Chattanooga set is also shown to include a BN Gondola (No.341G); the solid yellow Railbox Billboard Box Car; the Southern Pulpwood Car; and the General Purpose Caboose. Only the BN Gondola is listed in '86 among Freight Cars and it is displayed with the yellow barrels an not the white/gray culvert pipes included with this set. TYCO also provided 48-Poles and Signs; the 17-piece Bridge & Trestle Set (No.907); a TYCO-PAK (No.895) and a 36" x 45" oval of track. The Steam Locomotives section of the 1986 catalog is beginning to get a bit thin, but still includes a Chattanooga 0-8-0 Steam Loco & Tender (No.256B-15). This again includes a free Remote Switch and therefore carries the "B" in its stock number. The Chattanooga for 1987 returns with 1985's stock number of 7416, if the '87 TYCO catalog is accurate there is a big difference between the 1985 and 1987 offerings. For '85, the set is powered by our friend the 0-8-0 in solid black with white lettering carrying the 638 cab number. The 1987 model is still the same 0-8-0 Loco & Tender with Smoke, but now appears with silver accents on the boiler and a brown cab roof. This revised Chattanooga 0-8-0 also is numbered 1261, rather than 638. Beyond this change, the set seems identical to the one found back in 1985. Over in the Steam Locomotives section, TYCO presents the same solid black #638 Chattanooga 0-8-0 Steam Loco & Tender with Smoke (No.256-15). The "B" and the free switch offer is no longer found in the '87 product catalog. It is anyone's guess as to what might have been available at this time. TYCO adds further confusion by showing an inset image of the solid black #638 model crossing the bridge to point out the 17-piece Bridge & Trestle Set included in The Chattanooga set. Most likely one could assume both versions existed on shelves at the time. Continuing through the late '80s to 1990, TYCO continues to catalog a Chattanooga set that appears to go through no changes from its 1987 incarnation. TYCO does switch stock numbers from 7416 to 7419 during this period, but again I spot no differences in the sets. The separately available Chattanooga 0-8-0 Steam Loco & Tender (No.256-15) remains in the catalog through period too. The last TYCO Chug-Chug Sound in Box Car came decorated in Ralston Purina and does not appear to have been made available outside of the company's final Chattanooga Choo-Choo train sets in the early '90s. For its final pair of appearances, 1991 and 1992, in the TYCO product catalog, the name reverts to Chattanooga Choo-Choo (No.7425) and the set contents is very different from all previous offerings. The biggest change is the switch to mostly Yugoslovian-made items from the original Hong Kong produced TYCO pieces. TYCO exits HO-scale trains in 1993 and the last few years found many substitutions among items in the line. The Chattanooga set is no exception to these changes. 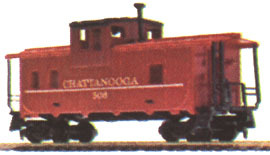 Though TYCO doesn't specify the wheel arrangement for its steam loco in the 1991 catalog, the image shows an 0-8-0 Chattanooga locomotive with the silver boiler-end and brown cab roof. The loco however has now become #917 in the Chattanooga roster. The boiler design and general appearance of this last Chattanooga 0-8-0 seems to favor the Mehano-made IHC Premier Series 2-8-2 Mikado Steam Engine. Very likely Mehano in Europe is the maker of both items. The last Chattanooga set is nicely equipped with the Chug-Chub Sound in Box Car and the Steam Whistle in Billboard, both see revisions for this final offering. Formerly decorated in the Baby Ruth Billboard Reefer's dress, the last Chug-Chug Box Car comes in Ralston Purina paint. The Maxwell House billboard insert differs on this final Steam Whistle in Billboard from what had been offered for many years. Review the large picture at the top of this page to see the different insert for the Maxwell House Steam Whistle in Billboard. The freight cars included in the final Chattanooga Choo-Choo sets may look like typical TYCO items, but a closer inspection will show you they are not typical. Made in Yugoslovia, the Railbox car is not the old TYCO 50' Plug-Door Box Car tooling. It is a modern no-roofwalk insulated plug 50' car that was not previously among TYCO's freight cars. The same goes for the 40' Texaco Tank Car, though it's body is not as different from the original TYCO tooling. The Bridge & Trestle Set seems to have lost two pieces beginning in 1991, as it is noted as now being a 15-piece set from the original 17-piece set included in prior sets. The set still features enough track to create a 36" x 45" oval and a TYCO-PAK. The is one final interesting inclusion in this set. TYCO notes the set comes with, "NEW! Quick-Clik Track Connectors." These were small plastic clips that attempted to hold together the steel track sections. Not today's good roadbed track, but it is a bit of an improvement on just hoping the rail connectors can keep it together. According to a 1991 TYCO dealer price list, the only steam engines available for sale separately at this time is the 0-6-0 and thus you could only get the revised 0-8-0 Chattanooga of the early '90s in sets. This same '91 dealer list also excludes the Steam Whistle Billboard and Chug-Chug Sound Box Car. One may assume that the revised examples of both of these accessories do not exist outside of train set offerings. 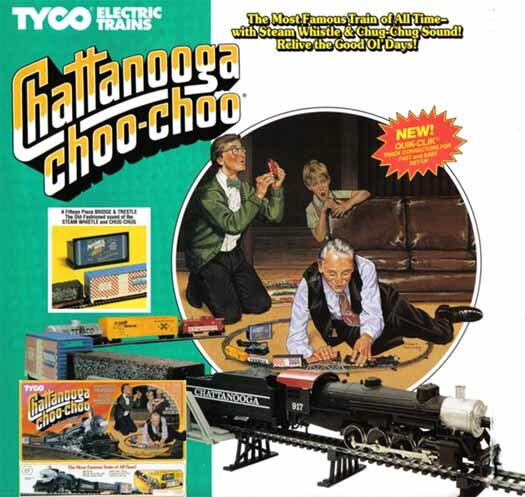 Without alteration, TYCO lists the same Chattanooga Choo-Choo set in its 1992 product catalog. There are only three train sets across two pages of TYCO's 1993 catalog and the Chattanooga is not among them. And that's the end-of-the-line for TYCO's Chattanooga trains. Though at first glance it would appear to be the typical Southern Railway Pulpwood Car found in numerous Chattanoog sets over the years, the last round of sets include this Chattanooga lettered Pulpwood Car. No counting the caboose offerings, this is the first and only freight car to get the Chattanooga name in TYCO's line. It may or may not be a Yugoslovian made piece of rolling stock. Below is what looks like a typical TYCO streamline cupola Chattanooga Caboose, however note the trucks among a few other differences and you'll see it is different. This is the final TYCO Chattanooga Caboose model and was produced in Yugoslovia and not Hong Kong. IHC-Hobby either inherited some examples or simply had Mehano run them again as they are also found in IHC boxes after TYCO departs the train market after 1993. From Bachmann's 2001 product catalog is the above picture of their Chattanooga Choo-Choo (No.00626). One must give Bachmann some points for actually having a steam loco decorated for The Nashville, Chattanooga & St. Louis Railroad. However, one wonders about that Chattanooga Choo-Choo logo, it certainly seems familiar. Images provided on this page are from a variety of sources including the author's collection, eBay auction images, TYCO product catalogs, Tony Lucio, and others. Information link sources include: Wikipedia.org among others.